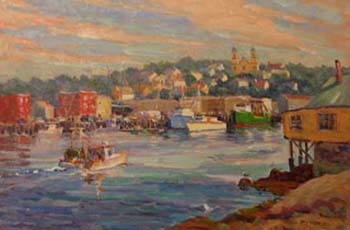 The major influence in my marine scenes was Emile Gruppe, a noted painter who lived in Gloucester and painted in the Cape Ann area for 60 years. I admire the way he captured the mood of that area using loose yet realistic brushwork to obtain dramatic effects. His paintings also demonstrated terrific drawing and composition skills. who edited three classic painting technique books by Gruppe. Bill Schmidt's paintings are realistic but painterly without undo emphasis on detail. 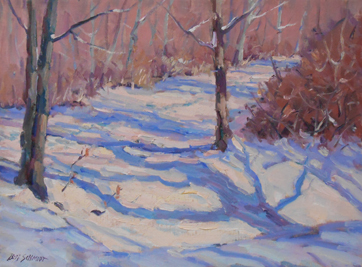 Bill selects certain elements to heighten and others to play down, carefully planning each painting to capture the nuances of light and color that let us see nature through the artist’s eyes. The Artist’s Magazine has published two articles on Bill. 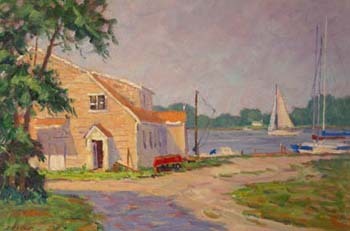 The first, "Preparing to Paint Outdoors," describes his painting style and his technique of painting year round on location. 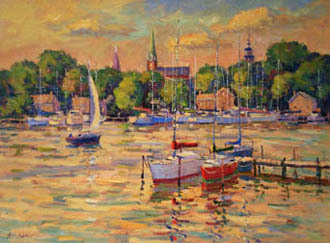 The most recent article, "Water Reflections," details his method of painting vibrant, lifelike reflections on water. 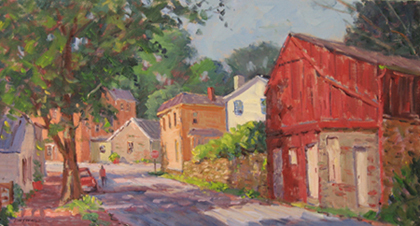 Schmidt is also included in the 2014 book, "100 Plein Air Painters of the Mid-Atlantic" by painter and author Gary Pendleton. Since l993, Bill Schmidt was hosted at 18 shows throughout Japan. 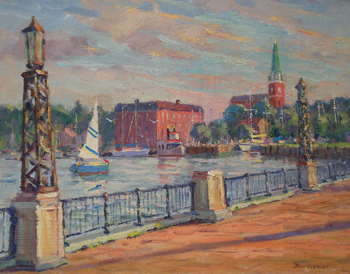 He received national attention for himself and for Annapolis when he was selected by Colville Publishing for publication of the silkscreen, "Annapolis Harbor," now sold out. 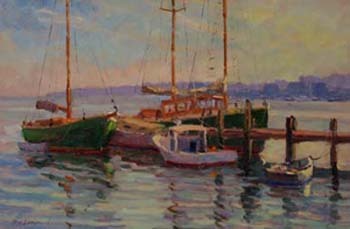 Seven silkscreens plus a poster of the Annapolis Boat Show were published. 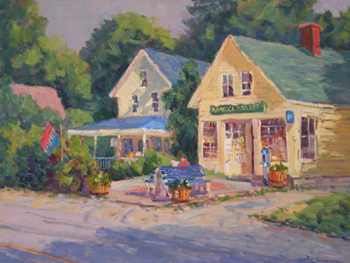 This national and international attention followed a series of special exhibitions and awards: selection to the top l00 painters in the National Art for the Parks competition on three occasions, selection into the Juried Oil Painters of America National Exhibition, the Southeast regional OPA Exhibition and selection into the International Marine Art Exhibit in Mystic, Connecticut. 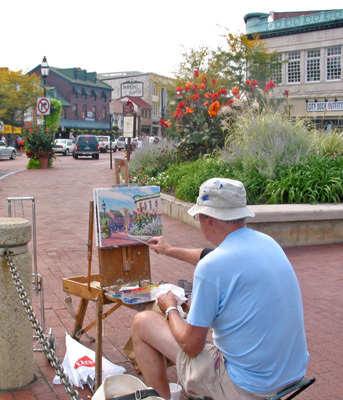 Bill is a member of the Washington Society of Landscape Painters and participated in the a number of museum shows including "Sunlight and Shadow" at the Leigh Yawkey Woodson Art Museum an exhibit at the Washington County Museum of Fine Arts. 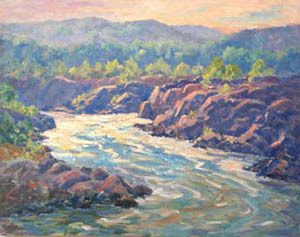 Bill Schmidt’s paintings have been selected for state, national and international exhibitions and for corporate and private collections, Bank of Baltimore, Franklin National Bank, Mortgage Bankers Association, the Maryland Association of CPA’s, the Oliver Carr Company, Towson State University, and the Baltimore Sun Newspaper.